To watch movies and TV shows on Kodi, you may not find a better option than the Death Streams Kodi addon. The Death Streams top level menu includes only three items. These are Movies, TV Shows, and Settings. It doesn’t get much simpler than the Kodi Death Streams addon for streaming video. You’ll also find the latest episodes of your favorite TV shows along with the latest movie releases. What is the Kodi Death Streams addon? The Death Streams Kodi addon uses code from one of the best Kodi addons of all time. The TVAddons team of developers abandoned Stream All The Sources (SALTS) long ago. This great streaming video Kodi addon then moved between a few Kodi repositories. A new renamed SALTS code fork by Mr Blamo, Death Streams receives regular code upgrades. Death Streams searches online and scrapes links to streaming movies and TV shows. It then provides you with a list of what’s available. Much of the content found online by the Death Streams addon isn’t licensed by the streaming servers. This is one reason it’s dangerous to use this addon without the help of a Virtual Private Network. A top-tier VPN such as IPVanish VPN hides your location, identity, and online activities. Grab the free IPVanish VPN app if you’re not set up with a VPN already. Their unequaled protection comes with a 7-day money back guarantee, so try it risk-free. IPVanish VPN is the only VPN provider that really caters to Kodi users. They even provide a free app optimized for the Amazon Firestick and Fire TV. Enable and disable individual video stream providers in the Death Streams settings menu. This very handy option helps when finding streaming video sources with bogus titles. You may also find sources compromised in other ways, so the ability to turn sources off is excellent. The organization and navigation make Death Streams very easy to use. This addon has top-level categories of Movies, TV Shows, and Settings. It doesn’t get much simpler while still allowing you full control of your streaming media center. Search TV shows by name in Death Streams or by genre, popularity, and other categories. This addon even has two TV listing calendar guides. One of the calendars gives information on upcoming shows of all sorts by air date and time. The other only specifies TV series premier dates, then gives information about those. If you’ve become comfortable installing Kodi addons, then you likely just need the repo source address. With Kodi 17 Krypton, the XBMC Foundation made many changes. Kodi now requires adjusting settings before allowing third-party addons. This makes installing the Mr Blamo repository impossible without tweaking the Kodi settings. Check our Enable Unknown Sources guide to make Kodi install unofficial addons. 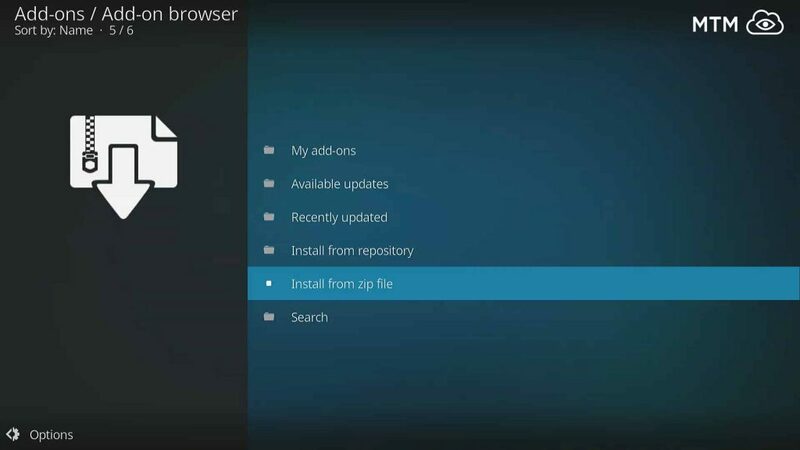 Before following our installation guide, you may wish to re-enable Kodi’s default skin. If you’ve installed a custom Kodi skin or build, the images below may not match what’s on your system. Our guide uses images taken from Estuary, Kodi’s current default skin. You may also see screenshots using the Estouchy skin for some illustrative purposes. The easy to follow step-by-step Kodi TV addon guide below enables you to install Death Streams on Kodi. Death Streams makes its home in the Mr Blamo repo. We must first introduce Kodi to the Mr Blamo repo URL. This allows Kodi to see the Mr Blamo repo as a viable source from which to install the Death Streams Addon. Go to Kodi’s main menu and click on the icon that looks like a gear cog. Enter the File manager by clicking on the folder icon. Next, click in the URL field that says <None> to enter a custom URL. Type the preceding url: http://repo.mrblamo.xyz/, then click OK.
Next, navigate to the text input below the source address field you typed into and enter Blamo. After that, click on the OK button again. Click OK to complete installation once you’ve double checked the repo source URL info is correct. Next, head back to Kodi’s main menu by double clicking the back button on your Fire TV remote, then click on Add-ons. At the top, click the Add-on browser icon. It looks like an open box and is sometimes referred to as the Package manager. Then click on __Install from zip file__from the list of options. Select the Blamo source we installed earlier. Then, click on the repository.blamo-X.X.X.zip file or select it and click on the OK button to install the Mr Blamo repo. It has the name of repository.blamo-0.1.3.zip at time of writing. Next you’ll see the dialog pop up in the top right of your screen telling you Blamo Repo Installed. Head to the Death Streams install section now to finish the installation process. To install Death Streams select the Blamo Repo. Select Death Streams for installation. You should see the Death Streams add-on installed message appear shortly. Congratulations on your new Death Streams Kodi TV addon installation! Pop that corn, fire up your IPVanish VPN app, and put a movie on! Death Streams works great on the latest Firestick and Fire TV . Give it a try! Be careful that you protect your location, identity and online activity from snoops by only using Death Streams through a secure VPN, though.